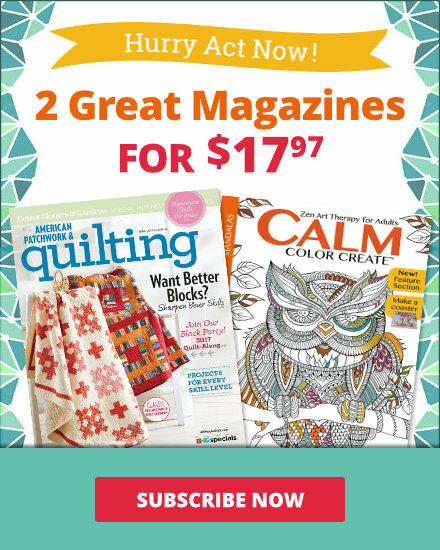 See the featured quilts and web-exclusive color options and projects from the American Patchwork & Quilting April 2016 issue. 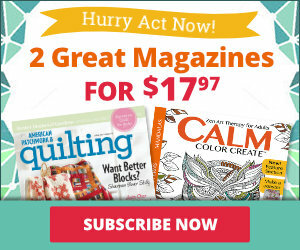 The April 2016 issue of American Patchwork & Quilting is on sale from February 2--April 4. In a studio near Times Square, Victoria Findlay Wolfe creates quilts that give tradition a contemporary kick. 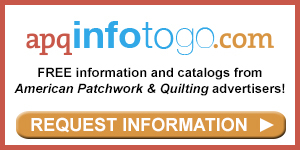 For more about Victoria’s quilts and fabrics, visit vfwquilts.com. 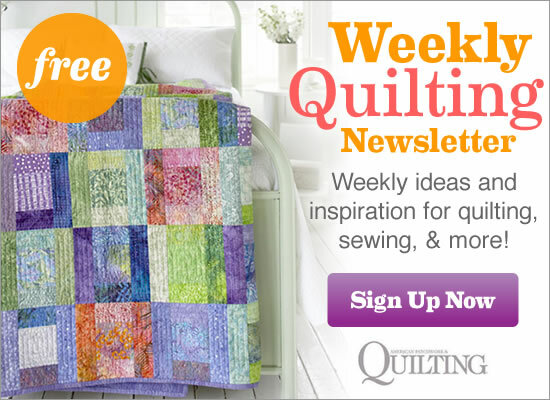 Whether you see chandeliers or birthday cakes, this quilt offers stacks of joy! The unexpected pairing of batiks and metallic prints results in a sophisticated wall hanging. A flannel Rail Fence bed quilt provides a neutral foundation for an appliquéd flannel topper. Use the topper in one of three ways. Quilt tester Laura Boehnke went bright and bold with her versions of the On the Rails quilt. She chose fabrics that read as solids from afar but actually are geometric tone-on-tones that offer the viewer a visual treat when examined up close. Go bright and bold with geometric tone-on-tones and a solid white. These prints create visual movement in the Rail Fence quilt. Use a slash-and-sew technique to carve up squares and add center strips or crosses. Join the pieced squares with unpieced squares to create one mega plus sign. Use bright prints and simple squares to create a plus sign design with kid appeal. Pieced plus signs within the blocks and a multicolor border add interest. Combine a Red Cross block with a Postage Stamp design of 1-inch squares for a positively striking quilt. Checkerboard block backgrounds step forward to garner attention over the plus signs in this wall hanging. Quilt as you go to make a bargello backdrop for fussy-cut butterfly appliqués. Quilt tester Laura Boehnke was literally seeing stars (and planets!) when making her version of All Aflutter. In place of the three solid white rows in the original quilt, Laura used a black outer space print. In this area, she fused on and stitched around planets, a sun, a moon, and a comet, all fussy-cut from two multicolor prints. Appliqué, embellish, and construct a handy needle keeper. It’s the perfect place to stash specialty sewing needles used for creative hand embroidery. A designer uses two variations of an Arrowheads block to create the look of cross-stitches and stars. Natalia Bonner machine-quilted this quilt using the Marmalade pantograph design by Patricia E. Ritter & Leisha Farnsworth of Urban Elementz. Use rich reds, browns, and creams in a cozy throw. Make your stars shine by using a different print for each one. If you received a windfall of triangle-squares in a swap, look no further: This scrappy design incorporates nearly 1,000 half-square triangles, all grounded by navy and pink. Using subtly patriotic prints, quilt tester Laura Boehnke made a narrow wall hanging that would look at home year-round. Laura wanted all of her pinwheels to “spin” in the same direction, so she paid close attention when piecing the pinwheel units. Fashion a pristine path of muted and bright colors in a flirty floral table runner. To visually bring out the blocks’ star points, quilt tester Laura Boehnke used a different arrangement of lights and darks in her corner units, contrasting the star points instead of matching them to the outer ring in her Square-in-a-Square units. 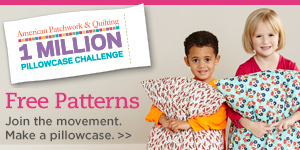 Follow our simple instructions to make a quilt with large, gentle angles. The tumblers and “stretched” hexagons provide a good introduction to set-in seams.